Tony Holler and nine-time Olympic gold medalist Carl Lewis, two of track’s good guys. Tony and Carl have shared the stage as featured speakers at track coaching workshops. Tony Holler and Chris Korfist are track training renegades. Tony, a track coach and honors chemistry teacher at Plainfield North High in the greater Chicago area, has trained many high school track state champions. When he coached JV football his teams went something like 39-4. Both coaches preach moderation — they value the athlete’s well-being over getting results that will advance their careers. Making training fun for young high school runners has brought them success. 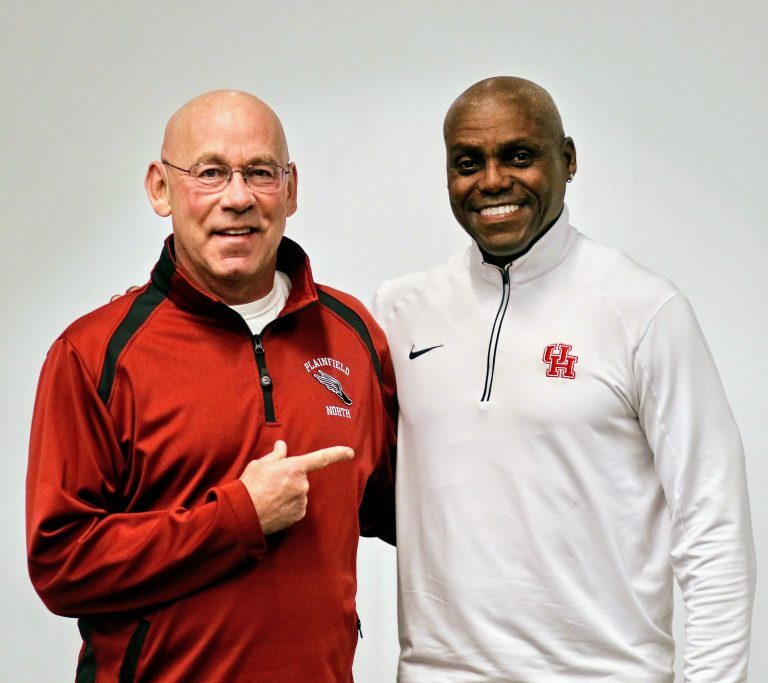 Chris and Tony founded the Track-Football Consortium, based on the thoroughly documented fact that an eye-popping number of football players who enjoy success at the college level were two- or three-sport athletes in high school. Chris Korfist is a legend in high-school sprint training. A sprint guru with an international following, he lays out his training philosophy on his website, Slow Guy Speed School. Chris posted some interesting thoughts today in an article, The Little Things. While it may not hold much interest for distance athletes, I love his concern for training young kids appropriately, and not driving them too hard. Thanks for this, Chris – I love it. At age 77 and as a former athlete (ultramarathon slogger) who sold his car and now rides a bike I found it pretty much agrees with my experiences. We tend to be SO linear and rational about training. Measurebators, fact-chasers, pixel-squeakies. It took me 20 painful years to realize that I had a built-in, absolutely reliable self-regulating monitor that could tell me how far and how fast to train. The body tells us when we’re sick by making us feel bad. When we’re exercising the body tells us what it can do by sending subtle signals of harmony or disharmony when we go too hard, too easy, or just right. During my career, I had terrible, melt-down long runs that I finished feeling absolutely wonderful, by lowering my pace to the “harmony zone” that felt just right. I finished in limp-home mode, feeling great. I think that for young people a coach who can spot the signals that indicate too much or too little is a genuine gold-plated blessing. Most if not all kids are way too amygdala-driven to be capable of the kind of strict self-discipline that produces happy, successful training. Bill Bowerman monitored his runners every day, and if their heart rate was high or their demeanor was droopy he would send them to the showers. He let Pre run hard much more often than Kenny Moore because Pre’s body could handle it and recover quickly, while Moore thrived by doing just one very hard workout every two weeks – the rest of the time he ran well within himself.